Back before computers, emails, twittering and facebook, people did that ancient and almost long-forgot practice of letter writing. Jane Austen scholars estimate she probably wrote close to three thousand letters during her lifetime, with almost all but the most carefully chosen supposedly destroyed by her sister Cassandra after her death. What was she trying to hide? Emma Douglas is determined to find out. Though her husband has just left her for his much younger graduate student and her career in academia all but destroyed because of it, Emma, an authority on all things Austen, heads to England to find these missing letters and rescue her self respect in the process. A mysterious widow has contacted her, claiming to have some of this as yet undiscovered correspondence in her possession, and will allow her access to them if she completes a series of tasks to prove herself worthy. So off across the country she sets, Jane Austen’s country – from Stevenson to Bath to Lyme Regis, in search of the author’s true identity, as well as her own. 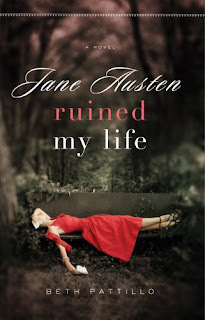 Jane Austen Ruined my Life is for fans of Austen herself, as Austenland was for the mini-series maniacs. I found the correspondence angle interesting since I’ve just finished a book detailing her letters that weren’t destroyed, My Dear Cassandra - The Letters of Jane Austen. sounds like a great addition to all the austenesque books on the market. Thanks for a great review. I'm hopelessly addicted I'm afraid. Pitiful I know. There are worse addictions I suppose...can't think of any now, but oh well. From your great review, I'm intrigued to read this book. I'll put it on my TBR list since I'm reading Mansfield Park and a couple of other books at the moment. I like reading books with the theme of the "long-forgot practice of letter writing" in them. Also, I did enjoy the description of Mrs. Parrot. It is a gem! Oh, how are you liking Mansfield Park? I thought that one okay compared to her others, but still good. If you're a Jane Austen fan, you'll probably enjoy this one. She included some details about her life I'd never heard of before. Sounds much better than The Jane Austen Book Club, which had very little to do with JA and a lot to do with California ladies in a books club. I think I'd prefer romping around the English countryside, retracing Jane's steps! Rose City Reader - actually, I really liked the Jane Austen Book Club. It didn't have much to do with Austen's life, but the author was able to parallel each section to one of Austen's main books. She wove them all together, which I thought was very clever and far better than I could have done. I was very pleasantly surprised by the book and decided I had to read all the rest of Austen (I'd only read Persuasion at that point, and seen some movies) and then go back to catch more of the parallels. Lula, so far so good on Mansfield park and i'm becoming a fan of JA so I do think i'll like this one. i'm having trouble with my keyboard at the moment with the shift key not working - excuse me for now with caps and punctuation.